Once daily and for an instant, there can be no single ecliptic degree rising at the Arctic or Antarctic Circles. It is therefore possible that a horoscope cast for one of these latitudes might have no Ascendant. At other places within the Polar Circles, horoscopes might have Ascendant and MC in conjunction or opposition. This paper explains why such phenomena cause the collapse of some methods of house division while leaving others virtually unaffected. It has been suggested to the writer that there is sometimes "no Ascendant" in the Polar Regions. While it is true that some sections of the Ecliptic cannot rise at these latitudes, this does not mean there is no Ascendant. There is practically always a rising degree and its ascension always occurs upon the eastern horizon, regardless of geographic latitude or hemisphere. At only one specific pair of latitudes is it possible to have no single degree crossing the Eastern horizon. This occurs at the Arctic or Antarctic Circles where, once daily, the entire Ecliptic and the entire local horizon coincide in the same plane, the former girdling the latter in every geographic direction. Such conjunctions last but an instant, so the chance of finding one in a horoscope is most improbable - but not impossible. For that moment there will be no single rising degree, presenting horoscopy and most methods of house division with several challenges. This conjunction is however as much a fact of Nature as it is inevitable under the laws of spherical geometry. A second such phenomenon occurs throughout the rest of the Polar Regions. During any 24-hour period, at every place within the Polar Circles, there are moments when the Ascendant conjoins the MC and then moves backward to oppose it. These conjunctions are also momentary - and rarely appear in horoscopes - but their occurrence is if anything more troublesome. The following charts are both set for 12:00 UT, 6th October 2002, at Murmansk, one of the Polar Regions' better known populated areas (68N57, 33E00). Following this moment, the MC moves on through Scorpio at its usual rate but, with the Ascendant almost stationary, the angles will soon conjoin in 4½ Sagittarius. At that instant the Ecliptic quadrants containing houses 10, 11, 12 and 4, 5, 6 vanish, leaving the Porphyry chart with just six houses and two ambiguous angles. The Regiomontanus horoscope will appear to contain no houses at all; under that system all house-cusps coincide at the points where the angles conjoin. These examples precede the conjunction by an hour or so but already their four Ecliptic quadrants seem impracticably distorted. This distortion, though real according to Porphyry and similar methods, is in fact illusory under Regiomontanus and a few others. Yet the inequalities depicted by both charts have been cited as a failure of all 'quadrant' house systems at extreme latitudes, with such imbalance between the quadrants considered unacceptable. Yet Northern European horoscopes using these and other methods often display a similar imbalance, and for exactly the same reasons. As such the Polar Regions provide the best conditions of all for testing the coherence of any theory of house division. Those that divide the celestial sphere into 12 segments, creating a celestial frame of reference that is quite independent of the Ecliptic circle. They include Campanus, Regiomontanus, Meridian (also referred to by Charles Carter as the "East Point" system), Topocentric and the semi-arc division. Those that obtain Asc and MC, by dividing the celestial sphere into four quadrants, but derive the other cusps from a subsequent division of the Ecliptic circle. Such methods include Alcabitius, Porphyry, Natural Graduation and Koch. The important difference between these categories concerns the relative size of their individual houses. Most systems in the first group divide the celestial sphere into 12 segments of equal space, though it is rarely possible to deduce this from the positions of their Ecliptic cusps. In contrast, the cusps of the second group often do provide a rough indication of how much celestial space is allotted to each of their houses - and quadrants - and it is clear from the Porphyry example above that none of these methods can serve the Polar skies. The theories behind systems of the second category may differ widely but it is not necessary to treat each in turn. Any house system that sub-divides the four Ecliptic quadrants of a horoscope, instead of first dividing celestial space, will fail once a day at the Polar Circles when horizon and Ecliptic coincide. Their failure at higher latitudes occurs twice daily when Ascendant and MC conjoin or oppose, with six houses disappearing as four Ecliptic quadrants become two Ecliptic hemispheres. At other times - and latitudes - the precepts underlying these methods ensure that the quadrants and therefore the houses may be so uneven that the horoscope is of scant practical use. Like Porphyry's method, the system attributed to Alcabitius was developed in and for latitudes nearer the Equator, where most quadrant systems produce roughly similar Ecliptic cusps. Cusps obtained by dividing the entire celestial sphere require either spherical trigonometry or more arduous and lengthy calculation. The relatively straightforward Alcabitius method provides a serviceable approximation of cusps otherwise obtained; but at these lower latitudes only, where horoscopes always have more equal Ecliptic quadrants. Inequalities between Ecliptic quadrants will prove far less relevant to the first category of quadrant division, though some methods raise other questions both at the Polar Regions and elsewhere. The Meridian system and the method devised by Morinus both work very well near the Poles, if only because neither uses true geographic latitude. These methods locate all horoscopes at the Equator, regardless of where an event occurs, so their 1st house cusps are rarely marked by the Ascendant. Moreover, since neither division uses the true local horizon, planets and degrees of the Zodiac actually above that horizon often appear below the horizontal axis of the chart-wheel and vice versa. Neither system represents the local skies and both ignore the rising degree. Artificial relocation of events occurs also under the Topocentric division's Polar Variant, a trigonometric device that exchanges apparently inconvenient Polar latitudes for more temperate climes. This revision of the system was adopted after its authors were forced to acknowledge that the original scheme would not work at higher latitudes, especially those immediately below the Polar Circles. Few if any computer programs include this "Variant" in their routines. In all three systems - Meridian, Morinus, Topocentric - problems arising at circumpolar latitudes are solved by avoiding those regions altogether, which is to ignore both the local horizon and the real Ascendant. Yet the local horizon is fundamental to astrology. It is the boundary line that separates the invisible sky from the visible and it is the eastern half of this line that generates the Ascendant. We saw in the first part of this series that the Ecliptic can rise at an any point along the eastern horizon, so by definition it is this half of any local horizon that separates the 12th and 1st houses, while the western horizon separates 7th from 6th. The North/South Meridian - also discussed in the first paper - is the other constant factor in quadrant house division. It separates the 9th and 10th houses in the skies above, and the 3rd from the 4th in the invisible skies underfoot. Looking south from any northern latitude, planets and stars found slightly to the left of the upper Meridian occupy the 10th house, while those to the right occupy the 9th. When Ecliptic and local horizon coincide, all planets will be found close to that horizon but only the Sun will necessarily lay upon it. Other bodies which, due to their Ecliptic latitude, are found slightly above the eastern horizon will occupy the 12th house, with those just below in the 1st. Planets visible to the west will tenant the 7th house, while those just below the western horizon fall in the 6th. Planets with much Ecliptic latitude may be found in other houses, especially those nearer to the South or North Points of the horizon, but otherwise all bodies would be 'angular' to the 1st or 7th house-lines. A chart with all planets angular to the horizon and no specific Ascendant is certainly unusual, but this is what can occur daily and quite naturally at the Polar Circles. When the Ascendant and MC coincide, and with them all the other Ecliptic cusps, a roughly comparable arrangement occurs. Although the house cusps have gathered together at two opposing points of the Ecliptic, the houses themselves have not. Houses that divide the celestial sphere by design, and then the Ecliptic by consequence, retain their celestial structure regardless of what happens in - or to - the Ecliptic. As such, planets will continue to occupy various houses, meaning that the horoscope is available for judgement even though it may not be possible to draw up a chart in the usual way. This division of the celestial sphere retains the same geometric structure, regardless of the latitude at which it is erected. It remains intact at the Polar Circles and beyond and will always generate twelve Ecliptic cusps, save for the occasions mentioned above. At higher latitudes, Campanian charts often contain most of the Ecliptic within two houses only - the 1st and 7th or 6th and 12th - but this does not mean that these houses are somehow larger than the rest. Just as many maps of the world necessarily distort the relative size of continental extremes, so it is impossible to represent a spherical system of domification via the Ecliptic. Campanus houses are all the same size and shape and are always equal in area but the disposition of the Ecliptic, as it passes through them, will often give a contrary impression. Northern European charts also show a marked imbalance, which can result in many Ecliptic cusps cramping into just one pair of signs, but none of this amounts to a theoretical objection to the Campanus system, nor to its circumpolar use. Other questions arising in respect of this method will be addressed in the concluding paper. Just as the 1st and 7th Ecliptic cusps can be lost at latitude 66½, so other pairs of cusps vanish in similar circumstances, elsewhere, under Regiomontanus. At approximately latitude 69½N, the 2nd and 8th cusps disappear when the boundary lines that normally generate them coincide with the Ecliptic. The boundary responsible for the 6th and 12th does the same, four sidereal hours later, causing those cusps to momentarily vanish. At about 78N, the 3rd and 9th cusps can likewise disappear, followed after eight sidereal hours by the 5th and 11th. In the absence of any of these cusps, as with the absence of a rising degree at latitude 66½, a planet's celestial co-ordinates will indicate its true house position. Regardless of geographic latitude or house system, the two great circles  that generate the four angles of the horoscope always divide the entire celestial sphere into four quadrants of equal celestial space. These quadrants are further sub-divided into three houses of equal space - at any latitude - by most methods in the first category. Regiomontanus houses are however of equal area in horoscopes cast for the Equator only, where several quadrant systems are necessarily identical. As we move away from the Equator, Regiomontanus divides the celestial sphere into increasingly unequal areas, with the 3rd, 4th, 9th, and 10th houses growing in size as the other eight steadily diminish. This growing disparity culminates at the Poles, where these four houses each occupy an entire celestial quadrant while the other eight houses vanish altogether, flattened into the Equatorial plane. Even at moderate Arctic and Northern European latitudes these eight houses are squeezed into less space than that occupied by the other four, meaning that over time there is less chance of finding a planet in any of them. The first point is little more than an observation but the second must be of serious concern as the issue raised is not confined to the Polar Regions. If the equal division of celestial space (or at least the fair chance of a planet tenanting any house) is considered important, then it must be understood that the modus rationalis favoured by Regiomontanus yields neither. Spatial and temporal inequalities inherent to the system are particularly apparent in the Polar Regions but they are hardly less evident in Scotland, for example. Such inequalities are present, to a greater or lesser extent, in all charts cast for anywhere other than the Equator, yet they are rarely reflected by the positions of the Ecliptic cusps of a horoscope. In the example chart above, most of the Ecliptic is contained within the 2nd and 8th houses, even though most of the sky resides in houses 3, 4, 9, and 10. This is nothing more than an accident of geometry but it does much to obscure the real imbalances present in the system. While all methods in the second category tend to divide celestial space unequally - even at the Equator - Regiomontanus always divides space unequally - except at the Equator. Theories of quadrant domification far out-number those discussed in this paper but in view of the obscurity of those not mentioned, further examination is thought unnecessary. We turn instead to the ecliptically equal divisions. In the absence of a single rising degree, this method fails at the Polar Circles at the instant Ecliptic and horizon coincide; like the second category of quadrant systems, it cannot retain a structure of houses during the conjunction. Since no other geometric lapse occurs, it is often assumed that Equal houses are otherwise available throughout the Polar Regions. They do however present a conceptual problem whenever the circumpolar Ascendant is in reverse and this will be addressed in the concluding paper. These divisions are the same as Equal house insofar as the Ecliptic longitude of the rising degree must first be determined, even though it is almost never used as the cusp of the 1st house. We shall return to them when Equal houses are again discussed. Most of the systems mentioned here concern the geometric division of two- or three-dimensional space and discussion has been limited to the division of space. However the methods of Regiomontanus and Koch are among those reputed to incorporate a division of the passage of time, though neither achieves this satisfactorily. Under Regiomontanus, time and space are equally divided in respect of the Equator only, regardless of where the event occurs. With Koch, time is divided in respect of just two segments of the celestial sphere. These limitations ensure that both systems present unacceptable divisions of space, with Koch houses overlapping each other  and Regiomontanus producing houses of disproportionately unequal size. 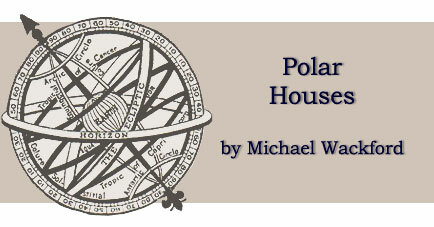 1 ] See 1st part of series, The Polar Horoscope, regarding the Ascendant's reverse motion. 2 ] (Addition, 2008) These remarks will apply also to the Polish Krusinski method (a.k.a. Amphora in the Czech Republic), as outlined in Wikipedia. 3 ] This writer has long held the view, unsupported by real evidence, that the scheme now attributed to Alcabitius may have derived from a misunderstanding of the semi-arc system. Placido de Titi did not invent the houses that now bear his name - nor did he lay claim to them - and the idea behind semi-arc division certainly pre-dates Ptolemy, who Placido named as his source. Under 'Placidus', the space between the eastern horizon and the Meridian is equally divided, but should the word "horizon" be confused with, or misinterpreted as, "Ascendant," Alcabitius houses are the inevitable geometric result. 4 ] This also occurs with Alcabitius, Porphyry and Natural Graduation, and for similar reasons - see note . 5 ] Problems associated with the Topocentric division and its inconsistencies were explored in greater depth by this writer (Loose Ends and Unrapt Parallels, A.J. Vol.36, No 5, but see Vol. 36, No 6, p.389 for errata), Robert Hand (Essays in Astrology, Para Research, 1982) and by many others, including José Lebrón (The Topocentric System - a review, A.J. Vol. 28 No 3, p.106). Sñr. Lebrón was at one time editor and publisher to Wendel Polich, inventor of the Topocentric method. Mr. Neil Gillings, who also corresponded with the proponents of this system, asserted that it was based on "a misconception of Placidus." Subsequent study of their works and of their reference material confirm his heartily expressed opinion. 7 ] A great circle is any circumference of a sphere. 8 ] Limitations of space preclude a thorough examination of the scheme attributed to Walter Koch, under which planets can tenant two houses at once. At more northerly latitudes, degrees of the Zodiac can also occupy two Koch houses simultaneously, though this is never made apparent by the chart-wheel. As with most other methods in the 2nd category, the North/South Meridian is not used to divide the 9th and 10th houses. It is replaced by a fictitious horizon, with the MC degree treated ipso facto as another Ascendant. Polar application of the system would therefore require a particularly lengthy discussion and this is not thought worthwhile. Michael Wackford hass studied astrology since 1976. For 11 years he studied and argued with the late Neil Gillings, a little known yet well-respected technical astrologer who was consulted by Ingrid Lind, Charles E. O. Carter, Roy Firebrace and others. The author has contributed articles to the AA Journal and the Traditional Astrologer and has also advised other astrologers. © Michael Wackford. Published online January 2008. This article was published in Correlation 21 (1) 2002/2003; pp.7-13.